Our summer projects of the past have consisted of building things: flowers bed, raised gardens and most recently, a tree house; of reading lots of novels and of doing more things together as a family. 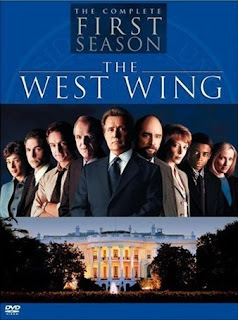 The summer of 2010 will include elements and whispers of warm days past, and it will include a new challenge: to watch the entire run of The West Wing, from 1999's inaugural season to 2006's finale. Heather and I enjoy watching seasons, as opposed to episodes. In other words, on successive evenings, during our alone time, we'll work our way through boxed sets. The Sopranos and Mad Men are two of our favourities. On some nights, when the mood is right, we'll do two or three episodes in a row. Other times, when we're more tired, a 50-minute single show is enough to assuage our cravings. As a normal television viewer, I ran into The West Wing many times. I couldn't tell you what day it played or what time, but its characters are familiar. Nearing the end of Season One, the characters are now very familiar, a reflection of many of the issues and dynamics that exist in my own work place: The Bob Lamb (toying with the idea of writing my own series). Sam Seaborn and Toby Ziegler argue and get excited about words and messaging. Kiran and I do the same thing in the Marketing and Communications department at the College, often debating about headlines, phrases and dangling modifiers. Josh Lyman is the Deputy Chief of Staff who helps set policy and direction-he "serves at the pleasure of the President." All of us, to a fault, do the same, every day. CJ Cregg is the Press Secretary, the public face of the Presidency who hosts the White House press briefings several times a day, managing the message and fielding the fly balls that come at her from all directions. Leo McGarry is the Chief of Staff, a position that apart from the President, yields the most power and influence in the big white house in DC. I like a million different things about this show but I particularly love that depending on the situation, everyone owns a challenge at one point or another-each is expected to step up to the plate to face the pitcher and hit the ball. And much like the theatrical ensemble reference that there are no small parts-because every role is integral-the same goes for a baseball team, or White House staff, or Marketing & Communications department. The Bartlet Administration flounders in their first term. Hesitant, uncertain, acquiescant, their legislative agenda sits in the on-deck circle as they cautiously bunt at hopes of positioning themselves for a second term. Bob Dylan once wrote "there's no success like failure, but failure's no success at all" (Love Minus Zero/No Limit - 1965). Eventually, they realize that success is not necessarily about winning so you can come back and play another day, it's about playing the game that's in front of you with your whole heart and soul, and the breadth of your conviction. Swing away, and let destiny decide who wins or loses.